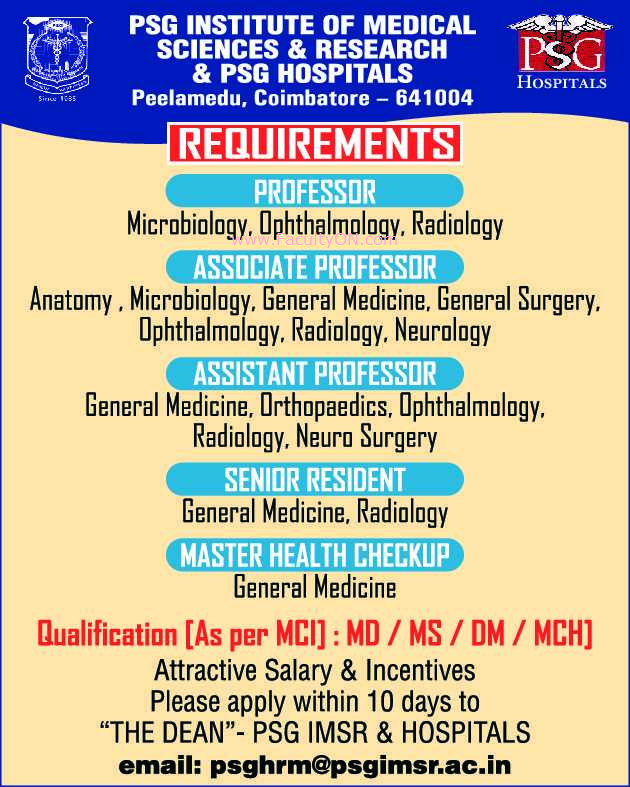 PSG Institute of Medical Science & Research, Coimbatore has advertised in THE TIMES OF INDIA newspaper for the recruitment of Teaching Faculty- Professor / Associate Professor / Assistant Professor Plus Senior Resident / Master Health Checkup jobs vacancies. Interested and eligible job aspirants are requested to apply within 10 days from 26th September 2018. Check out further more details below. About College: PSG Institute of Medical Sciences and Research is a teaching hospital and research institute located in Peelamedu, Coimbatore. It was established in 1985 as a part of PSG Group. It is the first teaching hospital in Tamil Nadu and the third teaching hospital in India to get NABH accreditation.